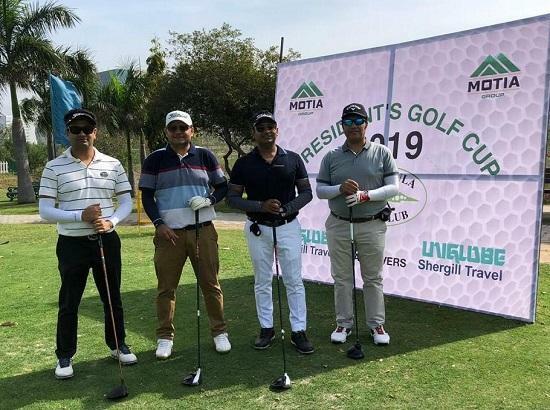 Chandigarh, April 15, 2019:: Panchkula Golf Club organised its third edition of annual President's Golf Cup Panchkula, powered by Motia Group; one of the leading real estate developers of Tricity. The two-day long annual event began on 13th April and concluded with a musical evening followed by the prize distribution ceremony on 14th April at Panchkula Golf Club, Sector -3, Panchkula. The event saw the participation of around 400 golf players including 16 women golfers from all over the region who enthusiastically played golf for President's Cup in the annual event. The overall cup was lifted by Group Captain D.R Chaudhary. Motia group was appreciated by Panchkula Golf club for its contribution in making the event a success. Mr. Meshi Mittal, Director of Motia group was honoured with a special appreciation award by the club for sponsoring and management of the activity. In addition to that, Motia group also gave goodies and golf balls to all the players. While talking about the event, Mr. L. C Mittal, Director, Motia Group said, "We are keen on holding such kind of events for the young generations and to promote sports in Tricity. We at Motia Group, keep on engaging ourselves in the activities for the interest of the public and for safeguarding the environment. We appreciate such activities and would like to be a part of such events in the future also."